The Joy of Sox, a nonprofit that provides socks to the homeless, earned the TOP RATED NONPROFIT award from Great Nonprofits. 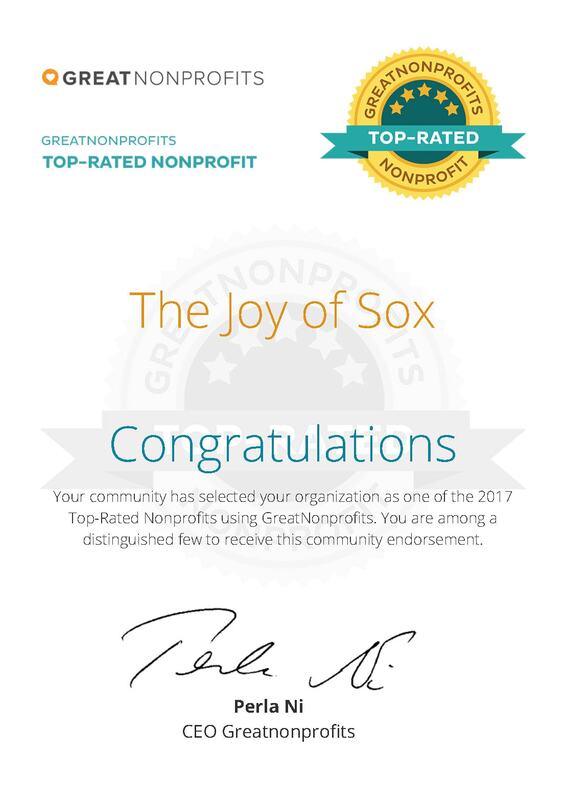 The Joy of Sox® would like to extend a really special thanks to all of their fans, donors, interns, sock angels, volunteers, and board members who helped them earn this very prestigious award. The award is special because only a small percentage of nonprofits get the Top-Rated rating. To see their profile and reviews on Great Nonprofit’s website page please click here. If you’d like to know how to get involved in your community and/or make a donation, please send them an email or give them a call at 610-688-3318 (they are in suburban Philadelphia USA, east coast time). They would love to hear from you and explain how you can also make an impact. The Joy of Sox® is a Philadelphia-based 501(c )(3) nonprofit with the mission of giving joy to the homeless by giving them new socks. Their vision is to be able to give six pairs of new socks to every homeless person in the United States several times a year. Founded in 2010 they have given over 228,000 pairs of new socks to the homeless in 31 states and four countries. For more information please visit www.TheJoyOfSox.org.